In Scots households, when the rare bit of citrus fruit from sunny climes made it into the house, none of it was thrown away. Even the rinds of the fruit, if not rendered into marmalade, were saved and savored. This time of year, there is nothing quite so festive as a gleaming clear glass jar filled with candied grapefruit or orange peels. These opalescent confections are addictive and in our household have to be hidden away, otherwise, every time one thinks of a reason to go to the kitchen (and there turn out to be many when these are about) one or two of them disappear. So, we hide them and parse them out to friends with other gifts that will not clutter up their homes for long. They know we have spent time thinking lovingly of them as we prepare them, and getting a small portion: no one gets hurt. 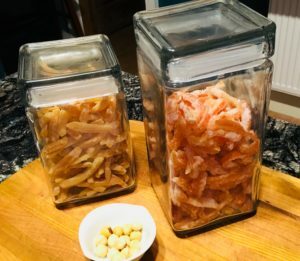 This year, I prepared rinds from four ruby grapefruits one day and six or eight medium-sized navel oranges. The process is what to watch here, recipes vary wildly and are all fine. Cooking is mostly about solving problems and maximizing flavor. Read through this and you’ll understand what and why. I’ll give you rough measurements at the end. To prepare the rind, I usually make a shallow cut in the rind, scribing it into quarters and then carefully peel the rind and most of the pith from the flesh, trying to leave the juice and fruit in tact. There are those who cut off the poles of the fruit and then peel the rinds away. This makes for more uniform peel strips, but you do essentially toss the ends. It’s a judgment call. I’m Scots. I throw very little away. Once all the fruit are peeled, then I cut the peel into ¼” strips (strips that are as wide as the peel is thick, or a little bit wider). Citrus rinds and the white pith are bitter. So, you’ll remove a portion of that bitterness by covering the prepared peels with cold water, bringing it to boil, simmering for a few minutes, then discarding the water. Rinse and repeat. This is done 3-5 times. The more this is done the softer the peel will be. I usually aim for 4 times, and with the grapefruit let them dry lightly covered with a cloth for two or three days before putting them in glass. Then you prepare a simple syrup: 1 part water to 1 part sugar by volume. Bring this to a boil in a pan large enough to accommodate the volume of peel you’ve prepared. When the sugar in dissolved, add the peel and stir them in. You can gently stir them as they cook, but take care not to break them all into bits as they get to the end of their cooking time. You will simmer them and reduce the syrup until either it is nearly all absorbed or the peels have a translucence to them. The pith will go from being white and opaque to being almost opalescent. Remove the peels at that point from the remaining syrup with a spider or a wire ladle (I get mine from the Oriental groceries, they are used for deep fat frying, tempura, etc.) and drain them carefully (hot sugar burns are hotter and worse that scalding!) and spread them out on drying racks set over parchment paper and sheet pans. Sprinkle granulated or powder sugar over them. A finer sugar is better for this, but I don’t like the other things that are in powdered sugar, so I usually run some granulated sugar through my spice mill (a whirring little $10 coffee grinder repurposed for roasted chiles, sugar, whole roasted curry spices, etc.) and use that. It is powdery and works like a charm. Toss the peels once they’ve cooled a bit in this fine sugar and then keep them up on the racks until they’re cool, at which point you can transfer them to dry sheet pans, cover them with a light cloth and let them dry fully for a day or two before putting them up. They should be sparkly on the outside and soft but chewy. If they feel fragile when you pick them up, let them dry a bit longer. They freeze well, though they don’t last that long around our house. And they’ll keep at room temperature, if the moisture content is right, for a few weeks usually. (They might eventually mold if they’re too wet. That is a real tragedy, so watch them and share them out generously, or refrigerate or freeze them. Let them come to room temperature before putting them out for guests. Combine 3 c. of water and 3 c. of sugar in a sauce pan and bring to a boil to dissolve. Add peels all at once, stir them in and turn the pan down to a gentle simmer. You want bubbles, but not a roaring boil. Cook, stirring occasionally until the peels are translucent. Remove from remaining sugar solution with a wire spider (slotted spoons hold far too much sugar solution and will make a bigger mess…you should have a spider anyway. Go get one.). Spread them on a metal drying rack over parchment paper in a sheet pan to cool. Sprinkle them with fine sugar and move them around a bit with a wooden spoon or something while they’re still hot. Remember, they’re really, really hot! As they cool toss them with a little more fine sugar until they are all separate and not sticking to each other. Let them fully cool, then dry under a clean light cloth for a couple of days before putting them up in airtight glass jars, freezing them, or refrigerating them. These candied rinds will develop a nice crisp outer skin encrusted with sugar while remaining soft and chewy inside. If they come out tough, you’ve over cooked them and drawn all the moisture out of the peels. They’re still useful ingredients, but, on their own, they will not be nearly as much fun in the mouth.